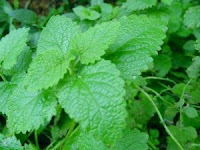 Lime balm (Melissa officinalis ''lime") is a perennial herb that shares many characteristics with its cousin lemon balm. It is as easy to grow but has a distinct limey fragrance. Lime balm is a half-hardy perennial that can add the aroma of lime to your dishes without the citrus. It likes dappled light and moist, fertile soil. Like its cousin, mint, lime balm can be invasive, so contain it with a border, or keep it in a pot. It grows to a height of about 18 inches and will cover anything in its path if you give it a spot it likes. It will return year after year without much encouragement and does well in zones five through nine. Keep it moist through the hot summer months, and give it a layer of insulating mulch in areas that experience triple digit highs. Easy to grow and propagate, lime balm can be started from root cuttings or seeds. Germinate seeds indoors eight weeks before you plan on putting them outside. Lime balm's seed casings are hard, so soak them in hot water for a day before planting and expect to wait a while before they germinate. A few weeks isn't too long. Keep lime balm in a sunny location, and don't let it go dry. Use a quality prepared potting soil, and choose a small pot of five inches or less. Potted lime balm does better when kept crowded. If your plant starts to get leggy, snip it back and give it more sun. Harvest throughout the summer by snipping or pinching. Lime balm grows back quickly and can tolerate heavy harvesting. Dehydrators are good vehicles for drying any plant in the mint family, although you can also dry lime balm by tying it in loose bunches with a rubber band and hanging it upside down in a warm room. You can dry it in a warm oven too. Try a small batch first and check for scorching. The dried leaves should be stored whole in an airtight container away from the light. Lime balm can be used in cooking, potpourri and crafts. It's tasty in a fruit salad, as an ingredient in marinades, and as a seasoning for fish, chicken or pork. Lime balm tea helps relieve tension, and the dried leaves can be used topically to treat bee stings. There is research underway that suggests lemon and lime balm may interfere with thyroid and sedative treatments. If you think you may be affected, consult your doctor before using Melissa officinalis. I like to use lime balm as a garnish for TexMex dishes. If I don't have a lime in the house, lime balm helps create that distinctive limey blending of ingredients, (red pepper, cumin, onion, garlic, and lime) even if I cheated and used lemon instead. Add an unexpected fragrance to your herb garden with lime balm. It will reward you with distinctive fragrance from spring to fall.